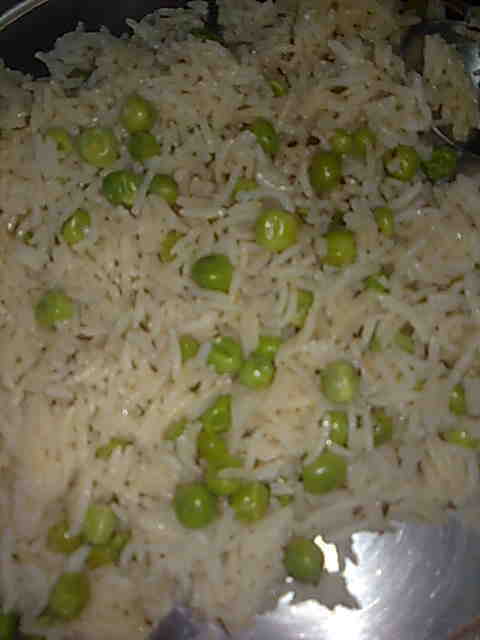 Matar pulao or pea pulao is a true quick fix meal. This is a real comfort food, very easy to make and tastes fabulous. Although I myself use frozen matar many times but the truth is it tastes much better with fresh peas. 1. Soak rice for 20 minutes. Drain. 2. Heat ghee in a pressure cooker and add cumin seeds, bay leaves, cloves and black cardamom. When they splutter, add peas and stir- fry for 1 minute. 3. Add rice and stir- fry for 1 minute. Add 2 cups of water and salt. Close the lid of the cooker and cook to 1 whistle. Let the lid be closed for 5-7 minutes before opening it. Serve hot matar pulao with cucumber raita.